Kaleidoscope happily welcomes children who are at least two-and-a-half years old (and potty trained). We feel lucky to continue teaching them for three years, getting to know them and getting them ready for first grade. Children thrive in a Montessori environment, because the space mandates that children follow and trust their natural inclinations toward movement, order, and exploration. Kaleidoscope's numbers will stay low; we will never have more than 18 children, so your child will have more individual attention and the chance to focus better in a quieter space. Kaleidoscope is mindfully cultivated to nurture your child's creativity and curiosity. We provide a prepared environment, which beckons children to understand the world around them. Through exploration of the materials, they also garner a deep understanding of mathematical, linguistic, and scientific concepts. We also empower the children to be their own advocates, to stand up for themselves, use their words, and protect others from harm. In doing so, we strive to have a peaceful environment of mutual collaboration. The multi-aged classroom allows children to deeply experience the sense of past, present, and future, and because of this, they help the younger children; they remember what it was like to be that small. They admire the older children; they look forward to being leaders in the classroom. They appreciate exactly where they are; their individual progress is celebrated. I received my Bachelor’s degree in Cognitive Developmental Psychology from Georgia College & State University. In between undergraduate and graduate schools, I was a Research Assistant at UVA. The Lead Researcher was doing extensive work on Montessori education, which I had never heard of before but learned so much about. Once I started learning about it, I was thrilled, hooked, and excited. I quickly realized I was on the wrong side of the glass: I didn’t want to pull kids away from their classrooms; I wanted to be in those classrooms. I pursued my Master’s degree in hopes to get into a classroom one day and to be able to reach children who squirm, ask too many questions, or who don’t fit convention. My Master’s Degree is in Gifted and Creative Education from UGA, where I learned about different models and methods to reach each child’s individual needs. After teaching at a public school for a year, I left to work at Athens Montessori School, where I taught in various capacities for six years. I substitute taught for a year, then I got a position as an Assistant. After just one year of teaching as an Assistant Teacher, I pursued my Montessori training in Kennesaw, Georgia, to begin my path toward lead teaching. I was the lead teacher for three years. I happily integrate my personal interests into this vocation of mine: I love baking and cooking with children, enriching music time with ukulele, inspiring them to pursue knitting and sewing, exposing them to artists and styles of art, and gardening. I graduated with a Certificate in Film Acting from The New Conservatory for Dramatic Arts 2009. I also studied Fine Art at both the University of North Georgia and the University of Georgia. I am delighted to see the number of ways we have already and can further incorporate artistic elements in our students' learning. I have had the pleasure of being Kaleidoscope's Assistant Teacher since January 2017. To be honest, before that I had not planned on being a teacher. But I now feel like the most fortunate person, handed such an unexpected gift. Being a part of Kaleidoscope, the methodology behind Ashley Holder's teaching, the mysterious joy that is children, the witnessing and experiencing of growth, all of it has been one of the greatest honors of my life. I moved to Athens in 1999, when I came to study at UGA for my undergraduate degree. In 2003, I received my Bachelor's degree in Music Theory and stayed at UGA for my Master's degree in Flute Performance, which I received in 2005. After graduate school, I moved to Atlanta for a year, taking orchestral auditions and teaching private flute and piano lessons. I then briefly worked in Charlotte, NC, selling flutes for a premiere flute shop J.L. Smith & Co., before returning to Athens with my husband, Brian Smith, as we expected the birth of our first daughter, Lorelei. When Lorelei was three years old, she attended Emmanuel Episcopal Day School, and I became a substitute teacher there. 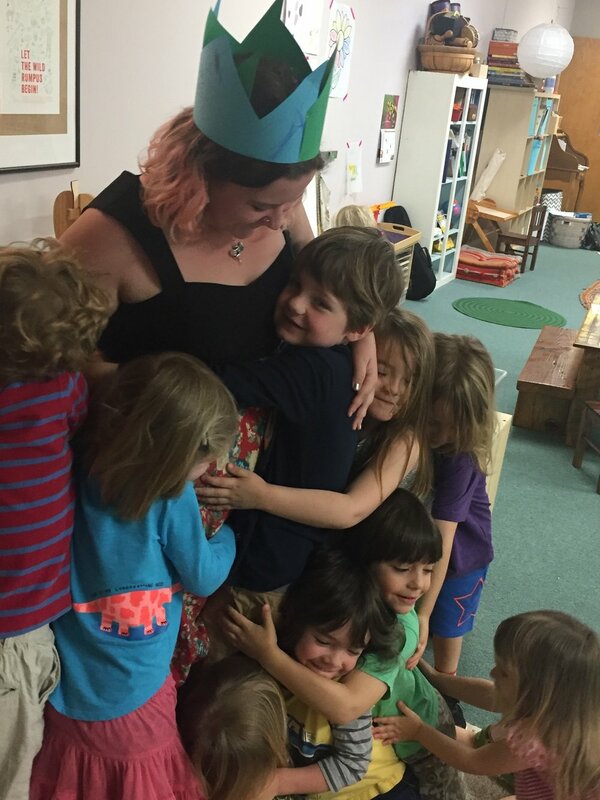 Though I had worked with children in private lessons and at arts and music camps, this was my first experience working at a preschool, and I fell in love. I realized that I truly enjoy being with young children in a classroom setting, observing their dynamics, helping them to work together and explore their worlds. I became an assistant teacher at Emmanuel the following year and also became the music teacher after the birth of my second daughter, Sylvia. I taught at Emmanuel for six years and each year grew more fond of my work with children. Now, I am happy to be teaching at Kaleidoscope and am looking forward to the ways we will all grow and change together. In addition to teaching, I am still an active flutist. I am principal flutist of the Gwinnett Ballet Theater Orchestra, the Greater Anderson Musical Arts Consortium Chamber Orchestra, and the Atlanta Philharmonic Orchestra. I regularly substitute with the Greenville Symphony Woodwind Quintet and have substituted with the Albany Symphony. I also play weekly at Athens First United Methodist Church and occasionally play for other special church services in Athens. My husband and I form a flute and guitar duo, the Musicsmiths, and play for weddings and special events. I decided that I wanted to work with children when I was two-years-old; at that point, I took care of my dolls. When I was four, I helped take care of my little brother and the younger kids in my class, and when I was seven, I moved on to entertaining the neighborhood children. Since then I have enjoyed babysitting, working at summer camps, and interning at Kaleidoscope over the 2017- 2018 school year. As an intern at Kaleidoscope, I affirmed my love for children and the Montessori style of teaching which I had previously experienced as a student. I am now a student at the University of North Georgia where I plan on pursuing a Bachelor's degree in Early Childhood Education and the after-school assistant at Kaleidoscope. I am thrilled to continue working and learning at Kaleidoscope, and I can’t wait to continue to grow and explore with the Kaleidoscope family. Our days are rich and full. Your child plays hard, concentrates for long periods of time, and has real-world and imaginative adventures. We want you to have a conversational foothold and to feel closely connected. We want to support you in celebrating, understanding, and encouraging your child. Please keep coming back to our website, because we will update our password-protected blog with articles about child development, Montessori method, and parenting issues. We will also feature class projects, units of study, and lyrics to the songs your child will sing around the house. Let us know what topic you might like to see on the blog, and we'll work to accommodate. We also have an instagram account, so please follow @kaleidoscopemontessori to get sneak peeks into our days! As an alternative, you can log into the blog, as we post all of our pictures there as well. We incorporate the preparation of snack into our morning work time: Picking vegetables from the garden, cutting vegetables or fruit, cooking rice or edamame, etc. Then, as part of our circle time, we eat snack communally. Snacks are all organic, compliant with sensitivities and allergies of the children, seasonal, and (when possible) local. We strive to have high-protein and complex carbohydrates We will keep you posted about what foods we eat daily as part of our ongoing strive to keep you informed and connected. We proudly and gladly open our doors. The school does not discriminate on the basis of race, color, gender, religion, sexual orientation, national or ethnic origin in admission or hiring policies. In its hiring practices the school will further not discriminate on the basis of age or economic status.